This is just the cleaning list. 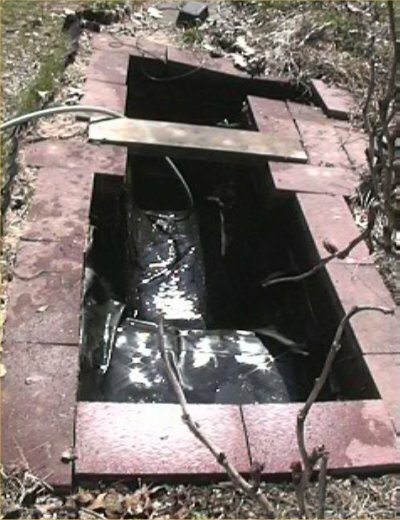 To see information on the 153 gallon pond's statistics, history, and past cleanings, go to my 153 Gallon Pond Page. Here is how the day's cleaning went on 3/29/04, detail by detail. I started collecting supplies at 8:30 am after doing my morning feeding chores. The air was at 48 degrees F and went up a few degrees during the day. The 153 gallon pond water was at 50 degrees F. It was partly cloudy, and the sun came out a few times. A light wind made it a pretty good day for this work (it rained the rest of the week!). All the supplies were ready so work began at 9:26 am. I followed the step-by-step directions listed above pretty much. While cleaning, I heard the pileated woodpecker, and I actually caught a glimpse of the male pileated. I still cannot believe my eyes when I see him. The pond contained hundreds of live tadpoles. I could see their intestines (unless they all had worms)! There were also many snails, mostly larger pond snails and some ramshorns (two species, one mini and one larger). The pond had a lot of dead larger ramshorns (empty shells). Only about 4 dead tadpoles were found. There were 9 female rosy red minnows and 3 male as well as one male red shiner, one female red shiner (looking a big anorexic), and one Southern redbelly dace. 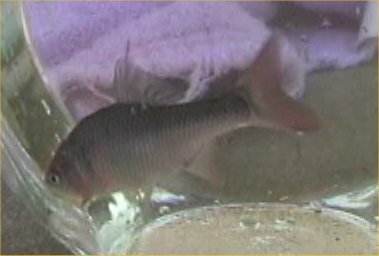 One female rosy red went through the Pondovac vacuum and was injured and suffered from it and could not swim (I am pretty sure she later died). 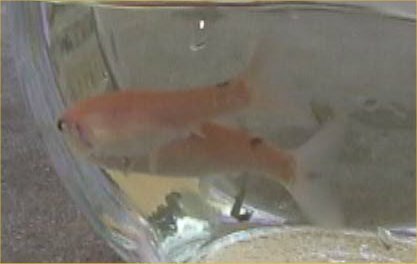 I hand-carried some of the fish to a glass bowl for digital photos. In the muck, there was a moderate-sized live female bullfrog, a very large (for her species but only half the size of the bullfrog) live female green frog, and a 3-inch dead pickerel frog. 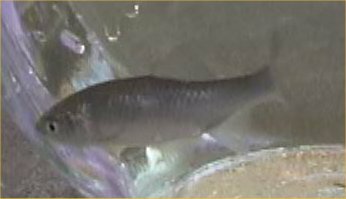 I had found two dead pickerels in my 1800 gallon pond last month, and I do not know why they keep dying! The only insects I came upon were one mayfly larvae (I think he did not make it) and one cranefly larvae that I took a photo of. I found a few dozen live earthworms including one that glowed green (I did not save him though) and a couple of dead slugs (yuck!). I added a lot of water back to the pond, up to the main marginal shelf (not the higher shelf which was the level I needed to go to before re-bailing everything back in). I installed the PondMaster filter and turned it on to help aerate the water. The Luft pump air stone was left to aid aeration as well. My well water is supersaturated with carbon dioxide so aeration is needed to lower the pH and also to get rid of the excess gases which can cause gas bubble disease in fish and aquatic animals. The time also allows the well water to warm up closer to the pond's normal temperature to avoid temperature shock for the animals. I added a dash of PondZyme, some BZT, a few teaspoons of baking soda, a cup of pond salt, and a tablespoon of Stress-Coat (I have well water so I add it for the aloe vera mostly). I did not measure anything. I returned the barley straw bag (kind of old) and barley pad in a plastic frame to the pond. Around 12:20 pm, I went inside for a 10 minute lunch. I replaced three of the regular bricks under the cap bricks that had disintegrated in the water. After lunch, it was time to repot. There were five one gallon pots of water lilies. Two were dead. One had big leaves. I repotted it into a two gallon pot. One of the others I put into a new one gallon. The final one I repotted into two one gallon pots. All four got new clay soil, a PondTabb per gallon, and a topping of new, clean pea gravel. There was a single one gallon pot of iris (blue or purple, not sure) in the overflow area which was somewhat overgrown and got a portion of it potted into another one gallon. It is easiest to use one of the pieces that hangs over the pot in the open water. In the main marginal area, there were three pots but you would never know it! They all came out in one big tangled clump that weighed a lot! I barely moved it. Using the utility knife and pruners, I cut the pots out. The pots had contained two kinds of iris (yellow and blue or purple, whichever that other one was not) and one pot of sweetflag. I repotted the sweetflag into a one gallon pot. The entire clump was taken over by the wild yellow iris. I could not find any sign of the other variety at all (the leaves are much smaller) so I just repotted a clump of the yellow iris into a two gallon pot. All got fresh dirt, fertilizer pills, and pea gravel. I tossed out a ton of iris and will get almost no flowers from these bunches this year. Alas, in this case, it is easiest for me to repot now instead of in the fall as is normal for iris. If I had not repotted these guys, that yellow iris would have put a hole in the liner eventually, it is that aggressive. I will miss all the flowers though. The two gallon lily and one of the one gallons went in the very bottom. The other two lilies, and the others went in the main marginal area except the one one gallon pot I mentioned of iris that went into the overflow area. When checking to see that the pond overflow showed that the pond was full, I lifted an edge brick and saw a cute male common toad. I would have taken a digital photo but the camcorder was full! By 3:40 pm, everything was put up for the day but some things were soaking in buckets with bleach and others drying in the bathtub to be dealt with later. The next day, my body was in a lot of pain! But the pond looks great! All of these photos were taken on 3/29/04. 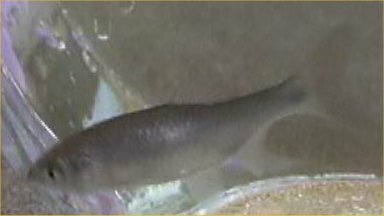 Male red shiner - left side. 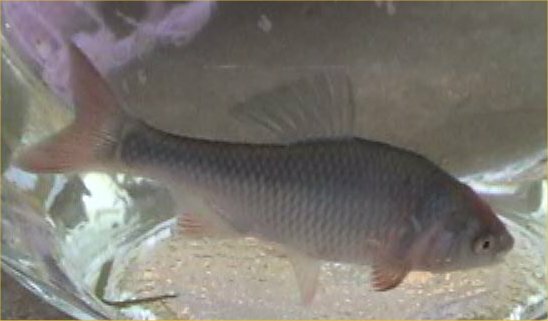 Male red shiner - right side. 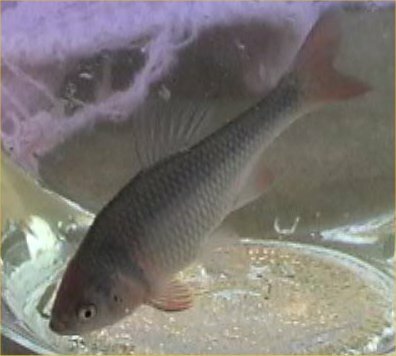 Female red shiner - left side. Entire Yard - during the cleaning. 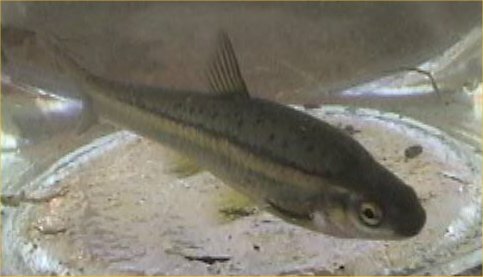 Southern redbelly dace - right side. 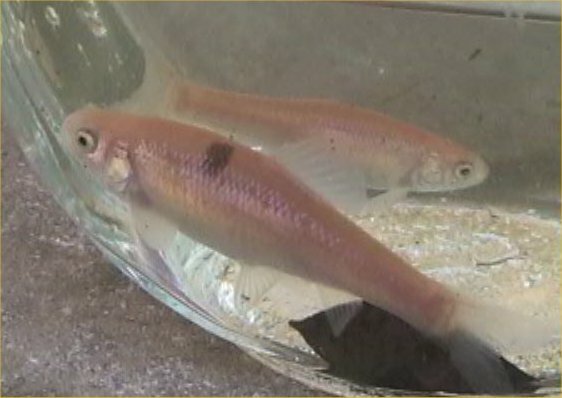 Southern redbelly dace - right side, same fish. Rosy red minnows - male on bottom front, female in the back. Rosy red minnows - two females (not the same individual as previous female). 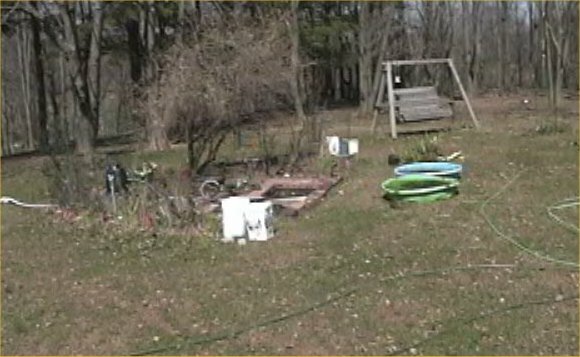 Empty pond - before refilling, after totally emptied. Back to the 153 gallon pond cleaning index.